A plugin that causes players (and or mobs) to drop their heads when they die. Players can drop their heads when they die based on configuration settings. 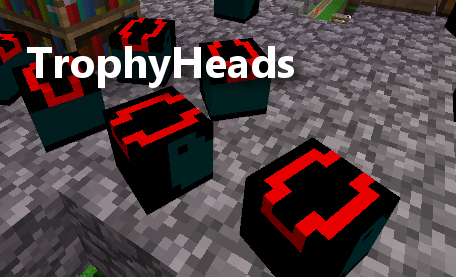 Players can rename heads using a named piece of paper plus a head in a craftbox. Right click a skull to see who it belonged to. Just drop the jar file in your plugins directory and restart your server. drop-chance - The percentage chance of player dropping a head. A whole number between 0 and 100.
death-types - A list containing any of the following. player-skin - Set to true or false. If true then a placed head will display the correct skin. Placing the head causes it to lose part of its meta data. To get info on a head use right click instead. are missing thus no work with the latest release :I Why it got removed? All of the heads on my server are displaying the Alex and Steve skins instead of any of the players or mobs. I've tried changing the "player-skin" and "rename-enabled" settings to every combination of true and false and nothing works. I haven't changed any of the skin names in the config. I'm running MC 1.9.4 and TrophyHeads 1.12.7-46. Nevermind. However, when breaking a head, it drops as an unknown head. Also, sometimes, heads of the same type do not stack. Running 1.8. Set player drop rate to 100, and players still do not drop heads. That's an interesting drop rate. I'm going to have to do some random number testing in java and see whats going on. My calculations are pretty simple. Even with a 4% drop rate you can technically drop 30 heads. It's all probability. It seems as though the drop rates are not what I have set them to in the config, I'm guessing that drop value of 100 means %100 drop chance, 1 would be %1. Most of the passive mobs I set to 4, but in-game the chance is a lot more than %4, i killed 30 cows and got 4 heads on my first test. Am I using the drop values incorrectly, if not then I think the drop chances could do with a touch up in the next update. I would like to have two separat permissions, one for killing players so that it drops heads and one that specifies if the player can drop their head. Most importantly we need a drop rate, the chance of a head drop per mob. The skins are not saved anywhere. The minecraft client will grab the skin from the mojang servers based on whatever the head is named. It is entirely possible for different clients to see different skins depending on how things are cached. How are the heads skin 'saved'? I can't see anything server side, so I am guessing its stored at the client side? Is this permanently saved or refreshed after a while? I am asking as we have a situation where some players are seeing different skins for the same player head or seeing a player head drop an old skin. I will add the elder guardians. This plugin is totally awesome! I love the fact that you can change the skulls for every mob type :) One question though, is it possible to add a skull to elder guardians? They seem to drop the same skull as guardians so far. When I set down a head and pick it back up, the lore with the death message is no longer there. Is there a way to fix this? Having the death messages on the head is very important to my server. Thanks.